Desert Rose Quilts: Christmas Cookies!! These were a little messy and I had to try a few different things but I think it was worth it. These are just nutter butters covered in chocolate and decorated. I tried to melt the chocolate over a double-boiler first, because I thought that was how you were supposed to melt chocolate, but it was difficult to cover the cookies in the shallow pan so then I read the directions on the package. Then I put more chocolate in a coffee mug and microwaved it. A tall, narrow container was better to dip cookies in than a pan on the stove. To covere a cookie, you have to kind of use two forks to roll it around in the chocolate. 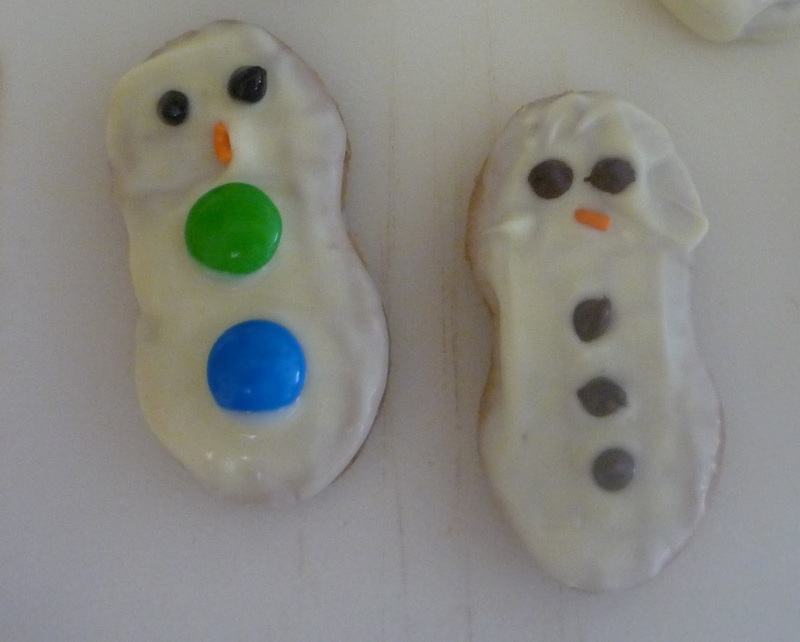 The snowmen are completely covered in white chocolate, and then decorated with mini chocolate chips. The noses are orange sprinkles I had leftover from Halloween. I was concerned with the bottoms getting messy so I switched to just spreading the chocolate on the top, but I should have covered them all. It keeps them crunchy for a couple days and it looks nicer. If you put them on parchment paper to harden they won't stick to the paper and will come off cleanly, leaving a pretty cookie. I found that dragging the bottoms against the mug after dipping eliminated some unattractive excess. After the snowmen hardened completely, I added a scarf with some gel tubes. For Santa, dip each end so the middle is bare, and use black decorating gel for the eyes. Put a dot where you want the nose and use it for the glue to stick the nose on. You can use a red-hot or a red M&M. Sprinkle red decors on his hat and you're good to go. I did not think the reindeer were going to work at all, but they turned out to be my favorite, plus the semi-sweet chocolate tastes best with peanut butter. Cover the whole thing in chocolate and lay it on parchment paper. Press the pretzels into the side of the cookie and just let them sit there until they harden completely. It will not seem like they're going to stick at all, but once the chocolate dries it will work perfectly. Use brown m&m's for the eyes and a red one for the nose. These are regular-sized but minis would be cute too. I put all of the cookies in the freezer to harden because I was worried about time, and this worked really well. Once they're set, you can stack them and I was a lot less worried about them not turning out. I would do it again, next time without all the mishaps. And now *drumroll please* my new favorite cookie. Move over chocolate chip, there's a new star in my kitchen. Peanut butter cups have always been my favorite candy but these are AWESOME. And way easier than the above decorative cookies. I bought a package of break-apart peanut butter cookie dough that made twelve large cookies. My mini muffin tin makes 24. So I broke each square in half and put it in a mini muffin spot. This is important: I greased the pan first. This is not usually the recommended protocol when you bake cookies, but I was not about to waste 24 peanut butter cups by getting them stuck in the pan, so I greased the pan first. Will it work without greasing it? You tell me. I'm not about to make that gamble. Anyway, I stuck it in the oven and watched it while I unwrapped 24 peanut butter cups. When they're done (and I mean your average doneness here, not raw even if you like them raw or overdone even if you like them overdone. You want it to be cooked all the way through and not burnt.) immediately stick a peanut butter cup into the middle of the mini-muffin shaped cookie. Imediately = have them unwrapped and waiting, do not take the cookies out of the pan yet, do not let them cool, barely even have your hand out of the oven mitt, immediately. Press it down into the middle of the cookie so the tops are even. And then wait. Wait, while your kitchen smells like heaven and you have fresh-baked peanut butter cookies screaming "eat me!" If you take them out too soon you have a higher chance of making a mess. Just wait until the cookies are completely cooled and you can give them a little twist to get them out of the pan and shove it in your face, and oh. my. god is this the best cookie ever. This was finally a pinterest recipe that made me want to shout, I MADE THIS!!!! And I now have an excuse to have peanut butter cups in my house at all times. Win.